Diamond drill bits for electric drills | Mistdia/IT series | Miyanaga America Corp.
Diamond grains have realized faster and more efficient drilling. Diamond grains and metal powders are sintered and used as the cutter blade. The unprecedented cutting ability allows drilling in difficult-to-machine materials. Moreover, the lineup of dry drilling type has improved drilling efficiency as well as solved the problem of a possible water leakage at the time of extension and alteration of building. The size is ø1/2" (12.5mm), but that of only the IT carbide drill is ø1/4" (6.5mm). ■Note: The reason why the noise level of the Mistdia Drill Bit is a little higher than those of the IT Drill, IT carbide drill, and IT diamond drill straight body is that the rotation speed of the used electric drill DW12SA is as high as 10,000 rpm. 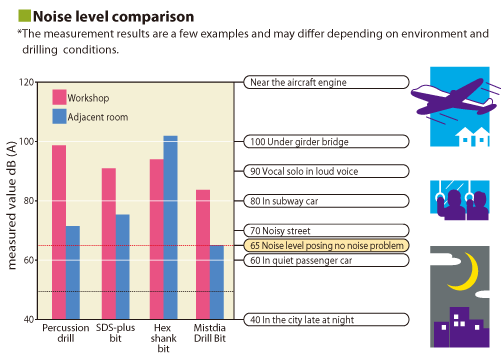 ○ These tests were performed on the third floor of a three-story reinforced concrete building. ○ Because the workshop was under reform, its interior decorations were removed.